North Suburban Soccer Association promotes youth soccer throughout the Roseville Area and Mounds View public school districts in the north metro area of the Twin Cities of Saint Paul and Minneapolis, Minnesota. This large area includes residents of Arden Hills, Falcon Heights, Lauderdale, Little Canada, Maplewood, Mounds View, New Brighton, North Oaks, Roseville, Shoreview and Vadnais Heights, as well as other surrounding communities. We are volunteers serving more than 1,000 youth through organized recreational, competitive and junior academy leagues for ages 3 through 18. Welcome to our Club! 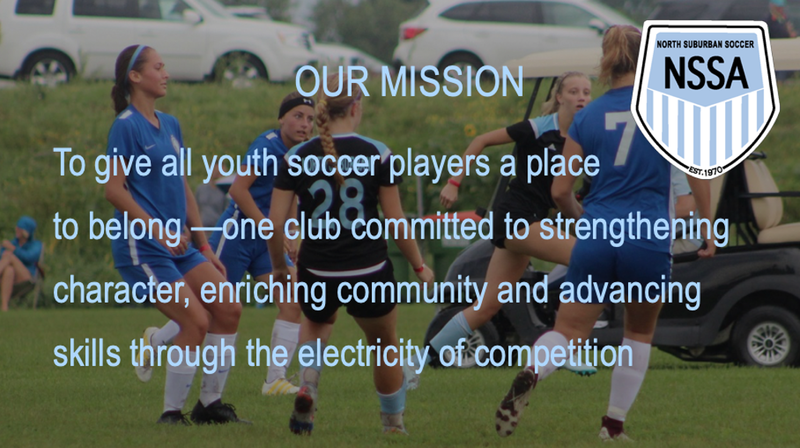 New mission statement expresses the club’s promise to give all soccer players in Roseville, Shoreview and the surrounding communities a place to belong. Roseville, Minn. — North Suburban Soccer Association (NSSA) announced today that its board of directors has approved a change to its club mission statement. With this shift, NSSA reaffirms its 49-year commitment to developing area youth soccer players to achieve lifelong success on and off the field. Founded in 1970, NSSA is the oldest youth soccer club in Minnesota. By approving the new mission statement, NSSA is pushing back against a trend in US youth soccer toward declining participation levels fueled by hyper-competitive environments and skyrocketing costs. NSSA serves over 1,000 competitive, recreational and Jr. Academy players, ages 3-18, across the northern suburbs of the Twin Cities. Guided by this new mission, the club will mark its upcoming 50-year anniversary by increasing its emphasis on community outreach, coach development, player safety and experience, inclusivity and partnerships — five pillars of NSSA’s strategic goals.